Daylight Savings Time came during the night, but we made no adjustment to our schedule to account for it. On one hand we could have fret that we lost an hour of sleep during the night and mutteringly wondered why it was so dark out in the morning. But instead we just got up at 5a instead of 4a so that it would appear nearly the same as it had the two previous days. 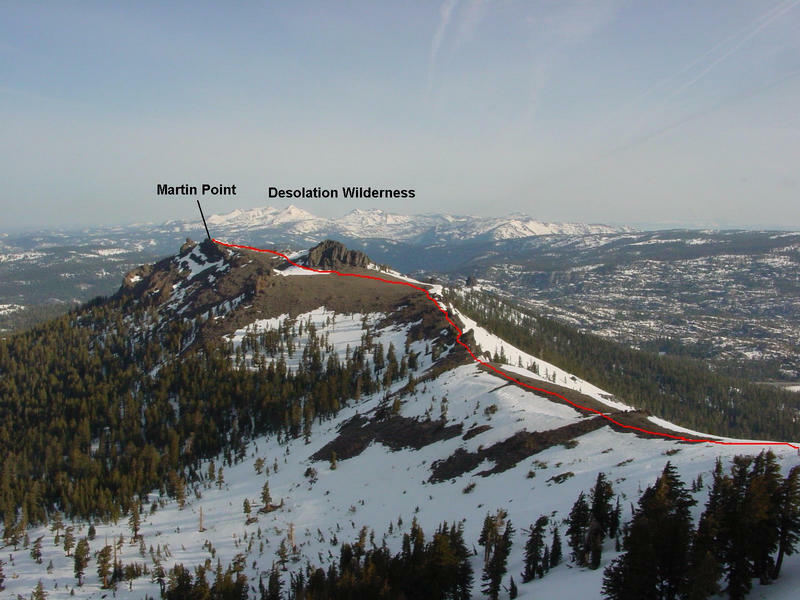 Our plan as we drove out of South Lake Tahoe was to bag Thunder Mtn (Amador County highpoint) and Thimble Peak (a class 4 summit block), a relatively mild outing. I had tried to talk Matthew into a more ambitious outing (and if you noted the title of this trip report you'll see I eventually succeeded) the night before, but we couldn't come to a satisfactory arrangement whereby we'd hike the entire ridge in opposite directions. The main sticking point seemed to be the summit block of Thimble - Matthew was very interested in climbing it, but was afraid if he was solo he would back down from it - a valid point. So how could we both hike the same direction and still do the whole ridge? I had a plan, but figured I'd wait to see how the day progressed before suggesting it. We arrived at Kirkwood around 6:15a, and some 15 minutes or so later we were off and climbing - along a groomed ski run. This was the same route I'd used three weeks earlier to reach Martin Point (which I had mistaken for Thunder Mtn). After five or ten minutes it occurred to Matthew that he'd forgotten his gloves, so we paused. Not wanting to go back to retrieve them, he asked me how long the day would take. About four hours, I surmised (It took us four and half just to reach Thimble Peak, so even if we'd kept to the original plan my estimate was well more than an hour off). Wisely, Matthew went back to retrieve them. The sun rose soon after his return, and we headed up through the trees on the right side of the ski area. It wasn't long before we switched to crampons for the steeper portions of the slope. The snow was well-consolidated, somewhat soft among the trees, harder higher up where it was more exposed. Again we had snowshoes with us, but this time we would manage without them the entire day. The slope heading up to Martin Point was steep enough that I somewhat wished I had an axe with me for additional safety - A slip would have sent either of us down several hundred feet into the trees with a questionable chance of arresting ourselves before impending injury. Fortunately, no falls. Even with the reset to retrieve the gloves, it took us only about an hour to reach Martin Point, almost 1500ft above the parking lot. We signed into the register and almost immediately I left to go over and check out the interesting NW summit a short distance away on the pretense that it might be higher, though it seemed unlikely. It was a short class 3 scramble from the side facing us, and once on top it was clear that all the other sides were considerably harder. It looked to be about the same height from atop, and that was enough to goad Matthew into climbing it as well after I'd come back down. Our next goal was Thunder Mtn, about a mile and a half distance, so we set off in that direction. We bypassed a rocky outcropping on the southwest side over some firm snow before landing on the sunny ridgetop and finding a very nice trail for the next half mile or so. Warning signs let us know we were at the ski area boundary, apparently they want to make sure to indemnify themselves to skiers who may chose to ski in unpatrolled parts (the bowl immediately west of the ridge in this case). We passed an interesting feature known as The Glove on the west side - it appeared to have no easy scramble route on any side. The bypass was not without some class 3 rock scrambling itself, which was far better than a steep snow traverse that we thought we might have to make when viewed from a distance. Thunder Mtn has two summits separated by about a quarter mile. The nearer northeast one is shown on the USGS maps as being 2 feet higher than the named southwest summit, but it is impossible without a level to tell which is higher. To be sure, we first climbed the northeast one (it has an abrupt drop on its southwest side along the ridgeline), then backed off and headed over to the southwest one. This took some time as we walked around a number of obstacles, clambering over rocky features in an effort to avoid the steeper snowy slopes just below on the southeast side. It was 9:15a when we reached the named summit where we found a large tackle box that served to hold the several summit registers - this is a popular peak. We could see south to Mokelumne Peak (where we'd been two days earlier), northwest to Desolation Wilderness, north to the Carson Range (where we were the previous day), northeast to Round Top and the Mokelumne Wilderness. It was a fine county highpoint, much better than some of the ones we'd visited earlier in the year. We made a small diversion to visit a nearby memorial to Paul M. Ruff, a skier who died in the area attempting to make a record 200ft jump in 1993. It was even more sobering to read his story on the Internet later while writing this report. A pair of old leather boots (presumeably his?) lay at the foot of the cross. After getting our requisite pictures, we headed back to the main ridge. Ahead of Matthew a short ways, I stopped for a class 3-4 diversion on an interesting rock formation. I went up what I would call a class 4 chimney on the right side, leaving my pack on the rocks below. After reaching the top I traversed across and found an easier class 3 route back down on the left, retrieved my pack, then rejoined Matthew who had patiently waited for me to finish the exercise. Heading east along the main ridge, we came upon the top of Chair 6 (Cornice) and the groomed cat tracks that graced the top. It made for easier travel, even if we had to share it with others, some of whom looked at us a bit oddly. Further east along the ridge, just past the chairlift we were greeted by a Skull & Crossbones Experts Only! sign. It was pretty much a class 1 walk the way we were taking it though. Most of the slopes heading down past the sign looked to be of the advanced category, but a few narrow, steep chutes would definitely qualify as expert. We continued along the ridge, favoring the easier slopes on the south side, much of which we found free of snow. We passed below the top of Chair 10 (Wagon Wheel) on the south side, and then climbed up to the top of the ridge again a short distance before Thimble Peak. Thimble Peak looked fairly innocuous from the west side that we approached from, but once atop the visible false summit, one could glare across a gaping chasm at the higher true summit. A thin, rocky ridge joins it to the main ridge, and it was obvious that this was the advertised class 4 route up the summit block. Before Matthew had time to get a view of it, I had crossed the twenty feet to the start and scrambled up. The rock was very solid with really good holds, but the exposure was a bit draining. Better not to think about it too much I figured. When Matthew popped his head into view I had been at the summit five or ten minutes, and greeted him with a friendly wave. Matthew looked at the intervening space but didn't wave back. "How was it?" he asked. "Not bad, really," was my attempt at an optimistic reply. With a bit of coaching and a great deal of self-determination, Matthew followed the short 15-foot section to the top. Success! At the summit we found a glass jar encased in a rusty tin can with something resembling epoxy, inside a small Sierra Club Register not two-thirds full dating back to 1964 - a real find. Ours was the first entry in over two years. Pete Yamagata's name was the only one I recognized in the register. Not being an SPS peak, it is ignored by the likes of Doug Mantle and RJ Secor, though we both agreed it was a true hidden gem of the Sierra. It was 11a now, having taken 4 1/2 hours to reach the peak (more than we thought the round trip would take). We discussed where to go next. I was up for continuing along the ridge. Matthew had pointed out the night before that we could continue along the ridge to Melissa Coray Peak, then drop down to Emigrant Valley to the north and back over a low saddle in the vicinity of Chairs 2 & 3. I thought that would involve a good deal of elevation gain, but from his TOPO! software last night and now the view before us, it didn't look so bad. So with little fanfare, we decided to continue along the ridge (the trap was nearly set...). First we had to get back off the summit block, and reversing the moves took a tad more nerve than it did climbing up, but with only one awkward move not found in Freedom of the Hills, we managed to extract ourselves from that loftly perch. Back on the snow, we headed down the North Face of Thimble Peak, a fairly steep slope with excellent runout for a thousand feet. The snow was softer here and there was almost no way we could have an uncontrolled slide, but Matthew remained cautious until I took a swift glissade down for several hundred feet. A group of skiers below watched the spectacle, probably wondering where we'd managed to lose our skis. We landed on a cat track and traverse over to the top of Chair 4 (Sunrise), continuing east along the ridge. The next peak was Covered Wagon Peak, though really it was just a long ridge with a highpoint somewhere in the middle. Here we started playing the game of staying on the ridge as faithfully as possible, primarily to enjoy some class 3 rock and snow we found there. It made for a really fine quarter mile traverse, some of the more enjoyable scrambling we found all day. The peak can easily be bypassed on the south side, but I was glad we found the more challenging scramble. At the far east end of the peak we had some more tricky downclimbing, but this was done with fine style and grace (unlike our descent of Thimble Peak). Next up was a short walk to the higher, but far tamer Melissa Coray Peak. At the saddle between it and Covered Wagon, we came across a sign indicating the crossing of a California historical trail. Apparently this spot, at 9,400ft, was the highest point in the Sierra to which a covered wagon was taken. Quite impressive, but in looking at the surrounding terrain, neither of us could figure out why anyone would have taken a wagon up here. Not on the Sierra Crest, and a thousand feet higher than Carson Pass, it seemed only someone who was lost could have managed such a feat. This saddle also marked the boundary between the ski area and the Mokelume Wilderness. We continued up the West Slopes of Melissa Coray, one of the most rounded peaks one can find in the Sierra - there was really nothing resembling a ridge leading to the summit on any side (later we noticed there are some steep slopes that get skied found on the north side). The top is broad and just discernably rounded, at the very center a memorial marker to Melissa Coray, an early pioneer who crossed with some of the first wagons over Carson Pass. As a mormon her writings have been carefully preserved and her memory immortalized by the Church with this fine plaque and the naming of the peak on which it was placed. To the side a short distance was a radio tower (the Wilderness boundary follows the ridge from the saddle up to the peak to allow the tower it would seem). Not satisfied with the nearly flat summit of Melissa Coray Peak, I climbed the 30 feet or so to the top of the tower, some of the more exposed climbing I would do all day - definitely satisfying. Matthew was content to let me do this one without him, even though I chided that the top of the tower was well above the summit marker. The memory in my digital camera was nearing its capacity, and with no clear indication how many pictures I might have remaining, I began to defer to Matthew to get the views and other shots. It was now 12:45p, and we figured we had about plenty of daylight left - about 7 hours or so. Round Top had seemed quite distance when we started the day, but it was looming nearer and higher the further east we travelled along the ridge. Thinking the time was ripe, I suggested to Matthew that instead of heading back through Emigrant Valley, it would be shorter to continue heading along the ridge to Carson Pass. Once at the pass, we ought to be able to thumb a ride from passing motorists back to Kirkwood. Matthew was of the same mind it turned out, and it seems I had spent far too much energy plotting the traverse than was necessary. So with almost no further discussion, we continued on. The next point on the ridge is Peak 9795ft just northwest of Melissa Coray. It is higher than both Covered Wagon and Melissa Coray, yet goes unnamed. In reading up about the naming of Melissa Coray Peak, there was mention of BGN stipulations that the peak cannot be in a Wilderness area (which Peak 9795ft falls in completely). It was a short walk and we marvelled at the many skiable chutes in the small, north-facing cirque formed by it and Melissa Coray. There were a number of tracks around where we walked and several of the chutes had been recently skied. It seems the whole ridge between Kirkwood and Round Top is a regular haunt of the backcountry ski crowd. We followed the ridge down the northeast side of the peak to a saddle and up to another small bump just west of Fourth of July Peak. Voices on the north side got my attention and upon looking over that way we saw 4 skiers skinning their way up to the ridge. Though the whole ridge was busy with tracks, these were the only skiers we saw out today between the ski area and Carson Pass. Fourth of July Peak was named feature number six for the day, and we arrived on the rounded summit just past 1:30p. The peak itself is nothing to write home about, pretty much class 1 or 2 from any angle. But it does provide a great view of the monarch on the ridge - Round Top, and an equally impressive view of The Sisters, our next stop. The weather was a bit more threatening now as the cloud layer began to lower and the higher peaks were obscured by passing clouds from time to time. It seemed prudent to get up and down Round Top before any threatened thunderstorms were to develop. The next section seemed like it would be harder than it turned out to be. After zipping down to the saddle where it crosses the trail, we had a long climb of 600ft back up to the rocky ridge. The 600 feet were a talus slog, but after that it became more fun. We still had another 400ft or so to the top of The Sisters, but now we had some class 3 that provided some entertainment, even as we were climbing into the clouds. Staying faithfully on the ridge the entire way to the top of The Sisters was great fun, some knife-edge, some exposure, and generally much better rock than the loose class 2 stuff found just off the ridge on the south side (the north side was a near vertical cliff for much of this). I arrived at the lower peak of The Sisters thinking I had was at the higher one (the lower had two closely spaced summits that fooled me) - it took me a moment to realize I wasn't looking at Round Top to the east so I must not be atop The Sisters. We reached the higher summit just after 3p. We could see the West Face of Round Top, but the clouds were swirling all about. A temporary hole of blue sky gave Matthew the delusion that it might be clearing (it wasn't). Heading off to Round Top, we took differing routes up the West Face. We tried to stay on solid rock where we could, but there is just too much loose rock on the west and south sides to avoid all of it. Just short of the higher east summit, I came upon one of the notches leading down to the Crescent Moon Couloir. I walked out onto the North Face a short distance so I could get my bearings and check out the eastern arm of the couloir. The snow looked pretty decent in it, and I was wishing I'd brought an axe. It was just before 4p when I reached the top, and maybe ten minutes later I heard Matthew's voice as he made his way to join me. We perused the summit register and I noted Doug Mantle's entry from Nov 2, 2002 where he commented that he had climbed Freel in the morning. Matthew remarked that he had met Doug on the summit of Round Top that very day as Doug was working on his quest to climb as many SPS peaks in a single year as possible (100+ we believe he finished with). Matthew was now on a similar quest, but he has a long way to go to reach 100 - I think Round Top made something like #14 for the year. I'd told my wife to expect me home around 8p that night, but with our extra-curricular activity we were going to be many hours later than that. I tried to use the cellphone to call her from Round Top's summit, got good signal indicators, but the call would not go through - try again later. Clouds all about us, we took a hard look at the East Ridge, our preferred descent route. It had two attractions - neither of us had used that route before, and it would make the more elegant route to continue our traverse of the ridgeline. But as the day was growing later now, it looked like it might take us several hours to cover the long East Ridge. Neither of us wanted to go back the West Ridge, a decidedly unappetizing route to us now. I hit upon the idea of the Crescent Moon Couloir. I'd been up the western arm but not the eastern one, so it would be fun to explore this other aspect of it. Matthew had wanted to try the couloir as well so he took to the idea immediately. Off we went back to the notch that I'd checked out earlier. We talked briefly about not having axes, but I countered that the snow conditions appeared quite favorable. I offered to go down first and kick steps to which Matthew happily agreed. My crampons weren't the best - this lightweight pair has smaller teeth, the front pair pointing down instead of forward as most standard crampons. They're really better off for lower angled snow slopes, but they would have to do. Matthew offered to switch with me but I declined, fearing mine would unnerve him even if he was following me. The upper 30 feet were the easiest - soft snow with an angle that actually inclined one into the rock on the side rather than down the steep face of the couloir. I kicked steps quite easily down this and waited for Matthew. I had a heavy pair of mittens I wore to keep my hands off the ice. Matthew had but a lightweight pair of gloves that would have been wet in short order. When I realized this, I told him to wait while I climbed back out of the couloir, then dug out a pair of overmittens I had in my pack. These would prove quite valuable as we were to be a long time coming down the couloir. I retraced my steps and Matthew followed easily enough. The next section looked down the barrel of the couloir and was quite steep and more than a bit discomforting. I told Matthew my plan was to head down about 15 feet then I'd start angling to my left at which time he could start down. This would keep me out of his fall line should he slip during the descent. After the easy upper section, the next several hundred feet were far more difficult. At first I had lots of strength and energy to kick excellent steps half the length of my foot into the snow. But the snow grew harder as I descended and I soon tired from the tremendous effort. My toes were none too appreciative either, and I could feel them throbbing with each blow I subjected them too. When I started to angle off to the left I found this harder in practice than I had expected. While descending straight down I could use the foot holes for hand placements as well as I moved past them and kicked lower steps. But now as I tried to angle, my left arm had nothing to hold on to, I couldn't punch a hold with my hand, and I felt insecure. To compensate, I lifted my left foot up and kicked an extra hole to the side with each regular step I made. This gave my left hand some purchase but put double duty on my left leg which soon tired. I found I couldn't keep angling so I switched back to heading straight down after about 15 steps or so. Matthew kept a good distance above me, about 20 feet or so, steadily descending at the same rate I could kick steps ahead of him. Within a few minutes of course he was directly above me and we were both descending the same line. Being on the bottom of this arrangement made me uneasy, but it seemed I couldn't have him hold off to the side or just wait until I was safely down. Matthew had so far descended about 50 feet over the steeper slope without seeming too unnerved, so that helped me some with my own anxiety. The most difficult part took a half hour descend, but it felt like twice that. I was surprised that my legs held up as well as they did after we'd already been out for so many hours, climbing over 5,000 feet. As I neared the "Y" junction in the couloir, the snow grew a bit softer. It was enough to let me change technique from kicking steps into the slope to using my weight to step down heavily on the slope and create the next foothold without a kick. This made all the difference in the amount of effort it took, and I now made rapid progress down to the bottom of the couloir. My toes were very thankful as well. I watched and waited for the next fifteen minutes as Matthew continued the descent in fine style. Never complaining, never getting unnerved, it was the most difficult snow slope I'd seen him on and he performed flawlessly. While I was waiting for Matthew I tried the cellphone again and to my surprise was able to get through while perched on a snow platform I'd stamped at the base of the couloir. Unfortunately I only got to speak less than a minute before the call was interupted, and I'd only been able to communicate that we wouldn't be home until midnight without any explanation. Hmmm - that might have given her more reason to worry than if I hadn't called in the first place. When Matthew reached my location I asked if he still wanted to hit peak #9 - Elephants Back. Like myself he was still interested, so I offered a modification to our plan. I'd go ahead (tagging Elephants Back of course) to Carson Pass and thumb a ride back to Kirkwood. Then I could bring the car back up to Carson Pass while he was finishing up the hike. That seemed pretty agreeable to Matthew (we were off the dangerous part of the mountain now), so I packed up and headed off. I went down in great leaps and bounds 800ft to Winnemucca Lake in less than 10 minutes - it was great fun, really. The less-than-fun part came next as I slogged my way up the southwest side of Elephants Back, the last 500ft of the day's climbing. I reached the non-obvious highpoint on the far north side of the ridge at 6p, the wind now blowing steadily. I moved a short ways down the east side to get out of the wind and try the cellphone again. This time I got a good connection and was able to convey the reason for our delay adequately. We talked for about two minutes, then I started down. The snow was much sloppier now and it would probably have helped some to switch to the snowshoes, but it became a test to see if I could go the whole day without them. I postholed a few times up to my thighs, but for the most part faired well in just my boots. Continuing along the ridge, I passed Frog Lake on its eastern shore, the PCT somewhere nearby still buried under the snow. I lost my drive to stay faithfully on the ridge when I saw a few more uphill bumps, so I bailed off to the east side when I was still a quarter mile from the pass. I found my way through the forest to the road, and walked the short uphill to the pass shortly after 6:30p - a fine 12hr outing.